Laundry is one of the few household tasks I enjoy. Something about removing stains and putting everything where it is supposed to go makes my heart flutter in a way that vacuuming doesn’t do it for me. 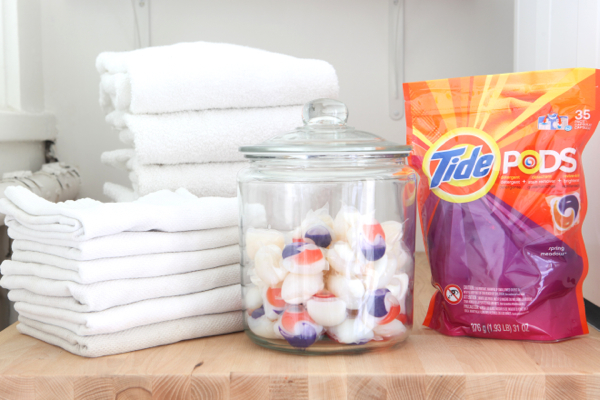 I’m working with Tide Pods on this post (you can get them at Target.) I’ve recently started using them and I like how easy it is to throw them into the washing machine (they have the detergent, brightener and stain remover in one pod.) 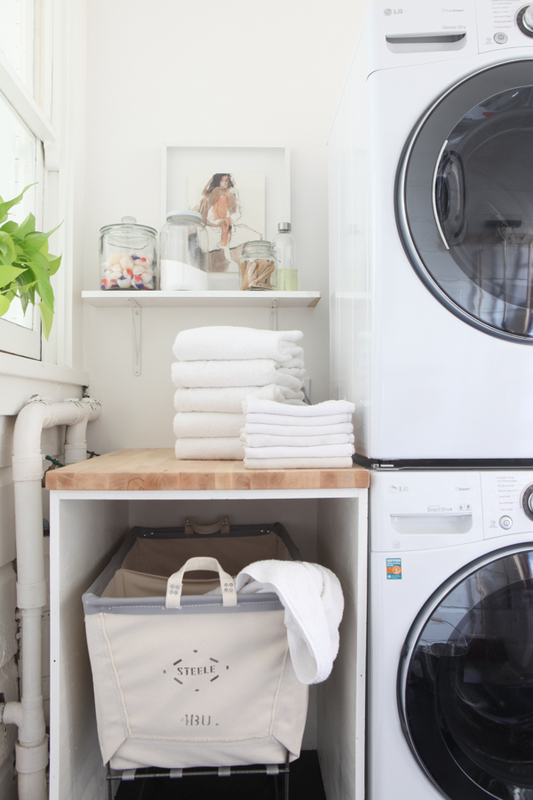 We recently gave our laundry room an overhaul (you can see “before” pics here) and I’ve put together a few tips on making a dirty job a little more enjoyable. My sister taught me something years ago that I’ve lived by ever since. It’s this: no matter what you buy (whether it is a trashcan or a lamp) it should be beautiful. I’m always on the hunt to find the most beautiful laundry basket or ironing board. 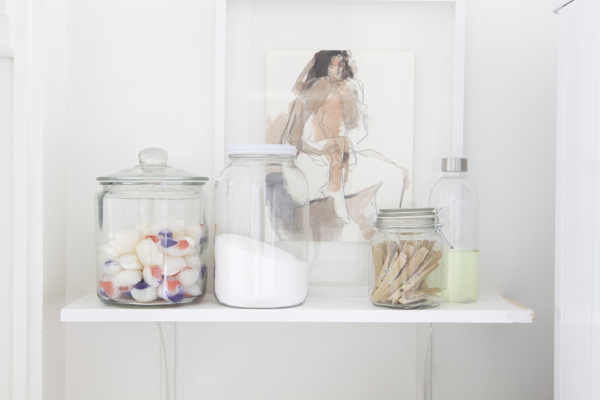 Even the most functional and plain things in our homes should make us happy. I realize its a silly thing but after about a decade of collecting I have a laundry room makes it a pleasant place to be when I’m folding laundry. I keep my laundry products like bleach and laundry detergent in simple labeled and unbranded bottles. Partly because I think it is prettier than loud packaging but also because I think it is easier to use, easier to refill and more accessible in jars. My friends think it’s a little neurotic but I swear it makes me so much happier. I’ve realized if I’m honest with myself about my real laundry habits (instead of my aspirational ones) then I can plan for it to be more functional. For example it usually takes me a few days to get around to folding the laundry. So I bought a large industrial laundry basket to hold all the clean clothes while they wait around to get folded. The laundry room still looks organized (and not backed up) even when I’m behind. We live in the city and don’t have a lot of space in our laundry room so the first thing we did is take advantage of the stackable feature most laundry machines have. That gave us more room to add a counter to fold clothes on. Also, we don’t have a lot of space to air-dry our clothes so keeping a foldable laundry rack tucked next to the dryer gives us that freedom without a clothesline. Just because it’s the laundry room doesn’t mean it shouldn’t be easy on the eyes. I add art and plants in every room in the house to make it a more enjoyable space to be. Where is that awesome laundry basket from?? I bought mine online, I know Crate and Barrel sells them too! I will love to have a laundry room! But I live in downtown Seattle and my washer is inside a closet. I wish there were more photos of the space! Yes, love this! It’s amazing how styling up something even as mundane as your laundry room can make you feel amazing. It’s gotta be done, so it might as well be fun! Re-doing my laundry room currently…would love to know where you got the wood countertops?? Thanks! Did you do anything to prettify or hide your hot water heater? A wide angle shot would be great to see so we can compare to the before. It’s ok if every angle isn’t magazine perfect, it’s just great to see how others do it in real life. The little section you showed though looks very bright and pretty. Yes! We hid it! More pictures coming, I am saving them for a bigger house tour. This looks adorable! I love it! I love how this turned out! We have a very similar space and I’ve been on the hunt for a little counter like the one you have. Would you mind sharing where you found yours? Thank you! as a mother of 4 girls, let me share my idea: All my girls have a nice box in their room. when it´s time to do the landry, they bring their box in the laundry room. we wash the boxes two by two and we put the clothes straight back in each box when we take it back in the dryer. tadam! No more effort from me and it´s always cute in every room! I simply bought bins in the famous swedish store! Now i have to teach them to fold the clothes in the drawers, well that´s another story! I love this! My laundry room could use some serious help right now. Curious where the Swash is? Next to the washer and dryer. But we might move it to the bedroom when we renovate. So pretty! Have been thinking about my mini laundry corner and this is perfect inspiration! Thank-you! I long for the day I have a laundry room instead of having it in the garage! Can you tell me were the industial Laundry bin is from?